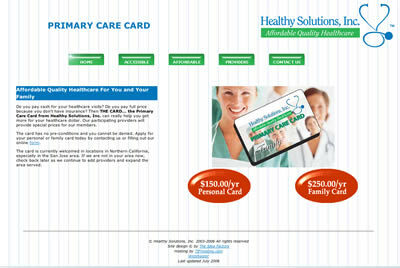 Healthy Solutions offered a discount medical care card based on subscribing physicians and labs who would provide a discount to card holders. As is the fate of many businesses, this one did not survive the five year start-up period. Does a design like this one look like something you would like for your company? If you are interested in seeing a working model of this site, contact us.